"1,500 word written assignment analysing critically the production design of one film/computer game." ...... it is, of course, Peter Jackson's King Kong! I chose this film for obvious reasons involving the creation of "Skull Island" and the overlooked "other" World they created, 1930's New York. I can't wait to "analyse" the production of these two worlds! Already gathering my source material from the library. hey Paul - I'm going to put this feedback on your proforma too, but when you blog, can you make a new post for each new development or addition, as opposed to adding more content via editing an existing post. When you add via editing a post, the additions are not flagged up on my dashboard, therefore I miss your uploads. I'm not suggesting you give every version of every image it's own post, but think about it in terms of giving over a new sheet of paper in a sketchbook when you're moving on. Cheers! Hi Phil, yep will do. I have been meaning to ask you if editing was ok, I was thinking I was missing out on the community vibe. I just like to keep things in chronological order. Am I on the right lines for my essay? I know we are watching the original so it might be a popular choice but I'm really enthusiastic about this one! But things will be in chronological order if you make a new post for each new 'chapter' etc - literally, like diary entries. The other downside of editing is that the most recent work is only found my scrolling down, as opposed to browsing 'up' - which just feels counter-intuitive - like the newest stuff is always on the bottom of the pile. I fear you must have felt rather neglected these past few weeks, because, the way dashboard works (as you know) is that you're automatically alerted to new posts, so, in a practical sense, your attention goes where the new posts are. 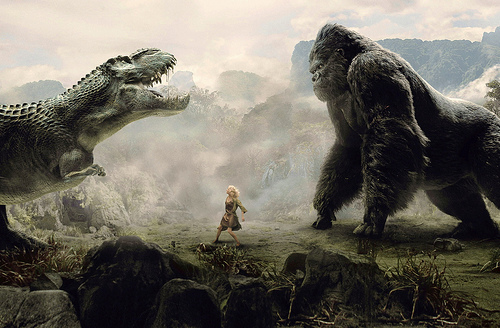 Anyway - yep, the production diaries for PJ's King Kong are exhaustive, so there should be boundless material there; but you're looking for a way to identify and discuss the 'visual concept' driving the look of the film's various locations; perhaps most interesting is the way in which PJ had to navigate the racism of the original movie (i.e. the view of the 'savages' with their mud huts and grass skirts); that's way he made the natives much more 'fantasy' than ethnic (at least that's my view), to avoid typecasting non-western peoples as 'primitives'. The dance sequence before Kong escapes is a direct recreation of the original depiction of the 'primitives' - PJ's method, I think, of critiquing the insensitivity of America in the 30's towards ideas of race. Anyway, yes, go for it. What I'm suggesting people do is create a 'quote post' which they use to gather together all useful quotes and sources in one place; start doing it now (and this is the one exception to the rule about making new posts for new info; just use the edit option here, because you're just 'storing' info, now opening it up for feedback opportunites.